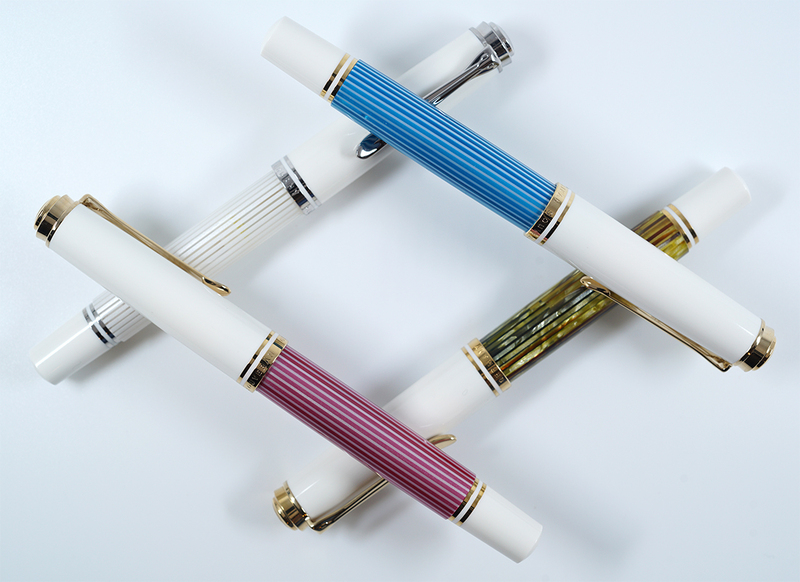 The M600 line has seen a revival of sorts in the last few years having been graced with several of the more colorful variants in Pelikan’s line-up. It would appear that someone at Pelikan really likes white. A bit larger than an M400 but not nearly as heavy as an M800, the M600 line of pens hits the sweet spot for many writing enthusiasts. These pens are roughly 5.28 inches in length, expand to 6.10 inches when posted, have a diameter of 0.49 inches, and a weight of 0.56 ounces. The ink capacity is somewhere around 1.30mL. To recap, the line’s white models include the M600 Tortoiseshell White (2012), M600 Pink (2015), M600 Turquoise-White (2018), and M605 White Transparent (2017). All of these models incorporate the same white resin components and have the same furniture. They vary in the patterns of their barrels and the M605 of course has palladium plated trim rather than gold. 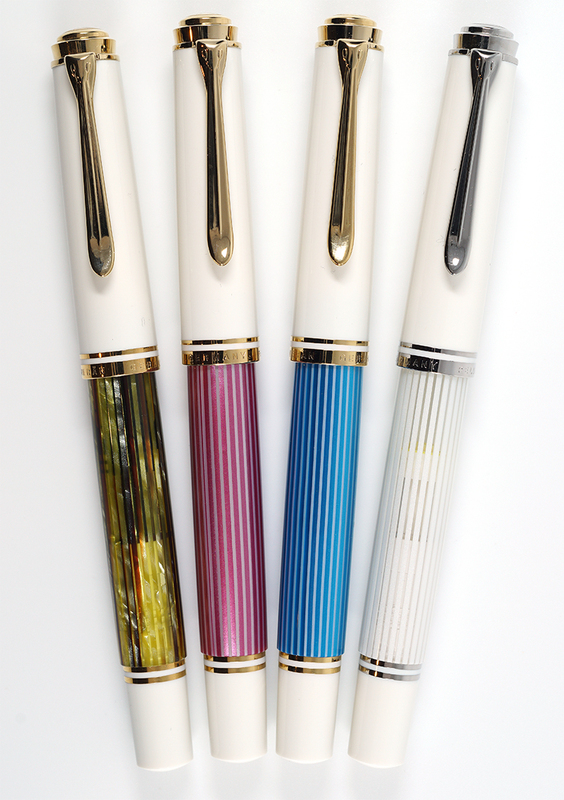 White pens have always been somewhat polarizing amongst those in the fountain pen community. They are perceived to be at a greater risk for staining which is a valid concern. That said, avoiding certain highly saturated inks and employing routine pen care can usually mitigate any issues that might mar an otherwise beautiful pen’s appearance. The color scheme and pattern of the M600 White Tortoise are identical to that of the M400 that preceded it. The barrel is done in a honey green tortoise pattern that is translucent when held to the light to allow for gauging the remaining ink level. The furniture includes two trim rings at the piston knob, a trim ring on the section, double cap bands, and a 24K plated crown cap top with a single chick logo. The cap, section, and piston knob are made from a white resin and the cap band is inscribed “Pelikan Souverän Germany.” These came with a two-toned 14C-585 gold nib in EF, F, M, and B widths. The White Tortoise M600 is rather hard to find for sale in today’s secondary market. The original US MSRP was $475 and they sold for around $380 when new. Expect to pay nearly double that if you can find one today. The M600 Pink came out three years after the White Tortoise and certainly raised some eyebrows. The initial marketing materials labeled this one as the “Ladies’s Collection” and it was depicted with a pink ribbon. Even the packaging had the appearance of a laced corset creating a small controversy amongst some in the community. Despite those missteps, the M600 Pink is definitely one that you have to see in person and one that I would not dare to label as a ladies only pen. As you can see, the furniture and white resin components are identical to those of the White Tortoise described above. What is different is the Pink striped barrel and, unlike the Tortoise, there is no ink view of any type. Included was a 14C-585 two toned nib in Pelikan’s standard widths. These have become very hard to come by in a short period of time. The US MSRP was $625 and they sold for $500 at retail making this the most expensive model of the quartet when new. Like the White Tortoise, expect to pay almost double that in today’s secondary market. The M600 Turquoise-White is the most recent release to utilize white resin. Similar to the M600 Pink, this model utilizes Turquoise stripes to achieve a very striking appearance. One thing that you might note on any of these models is that not all of the stripes are completely identical. There are some minor variations introduced in the material during production which can add a bit of character to a pen. Aside from the difference in color, the other trappings of the Pink are preserved here including the lack of an ink view window. The standard gold-plated furniture of the M600 as previously described is represented and the nib remains a two-toned 14C-585 gold. The US MSRP is $500 for this one with street pricing of around $400 and these still remain available in retail channels though likely not for long. Given how the previous two models described have doubled in price, it may not be wise to wait on this one if you’re at all inclined to pick one up. The M605 White Transparent was a model from last year and, as the name implies, it returned the translucency to the barrel’s stripes so that the ink chamber and its contents could be viewed. While the furniture is the same as what we’ve previously examined, the plating is palladium instead of 24 karat gold. The nib is made of a 14C-585 rhodium plated gold with a monotone silver colored appearance. The US MSRP for this model was $475 with retail pricing of $380 turning back the hands of time and resurrecting pricing seen 5 years prior, a welcome relief for enthusiasts. These can still be found in the retail channels if you’re interested. I had never heard of the “not wearing white after labor day” rule. So, it is really cool to learn about it. The White M600’s are gorgeous. My wife missed out on the pink when it was released, but fortunately last week we found a store that still had them and one is “en route” to us right now (and we paid less than retail). The only one we’re missing now is the tortoise, but I came into the hobby 2 years after it was released and never saw one for sale. Great find on the Pink! I had a similar experience in tracking one down and consider myself very lucky. The Tortoise is quite hard to locate these days at a reasonable price but they are out there if you’re patient. Thanks Joshua; enjoyed the article. I haven’t ventured outside the M8xx pens yet, which causes me to miss out on some nice looking pens. I just like the size and feel of the M8xx’s. On the bright side, it keeps me from getting too carried away with buying too many. However, I enjoy looking at them and learning about them. So, thanks. Interesting to learn about Labor Day too. You’re most welcome. Glad to hear that you enjoyed it. I envy your restraint. It’s always neat for me to research these little tidbits. The White Transparent is a great pen. Enjoy! Don’t be lame – they’re pens not fashion! You may have a point but, on the other hand, if you’re paying $500 for a pen, you could make the argument that you’ve gone well beyond a functional writing instrument and crossed over into a luxury item that’s as much fashion as it is function. You’ve been missing out but not too much. The M600 is identical to the M400 except for its size of course. I have similar thoughts as you about ink view windows but this one looks so good in person, that I wouldn’t let it deter me at all. The Pelikan marketing pictures show a sophisticated “ivory” off-white color in their promotional pictures which is far from representational of the real object. Glad your picture is more true to form. In real life, the white regions of the pens have a flat cheap white plastic look. Nothing ivory about them. I am a Pelikan fan, but this strategy from Pelikan is unseemly. I agree that the initial promotional pics were quite misleading. I was hoping for the ivory color personally but wasn’t too disappointed with the final product. I know many were. While these are a bit harder to photograph, they aren’t that hard. I tried to give an accurate representation and am happy to read that it was somewhat successful. 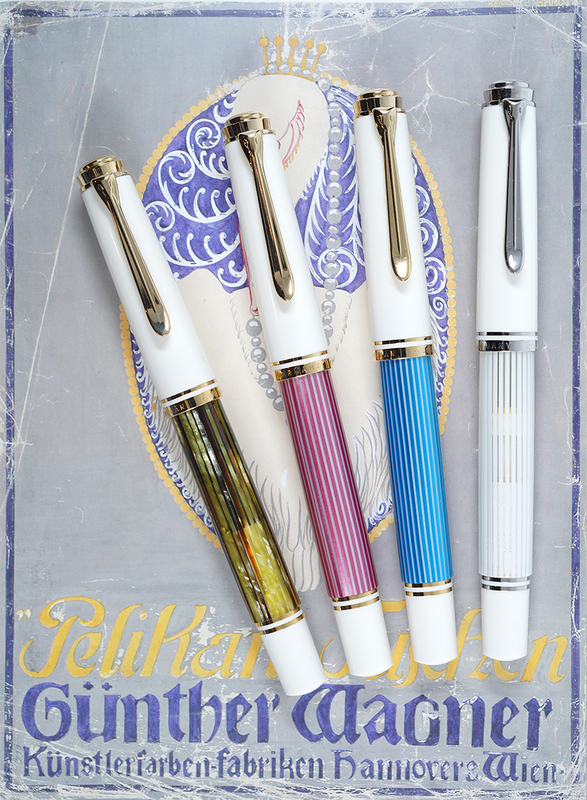 Hopefully Pelikan will do better in the future.